Honestly, until this recipe, I’ve never enjoyed goji berries any other way than dipped and coated in dark chocolate. I’ve always had them as a dessert, but they’re a great addition to something savory, like today’s salad. There has been some controversy over goji berries – actually, some places (like Europe, for example) are challenging all the health claims made about goji berries. Some say goji berries help with aging, sleep performance and weight loss. They’re also a great source of Vitamin A, apparently. Who knows if that’s all true, but since they carry that beta-carotene (on account of their reddish-orange color), we know they help promote healthy skin! 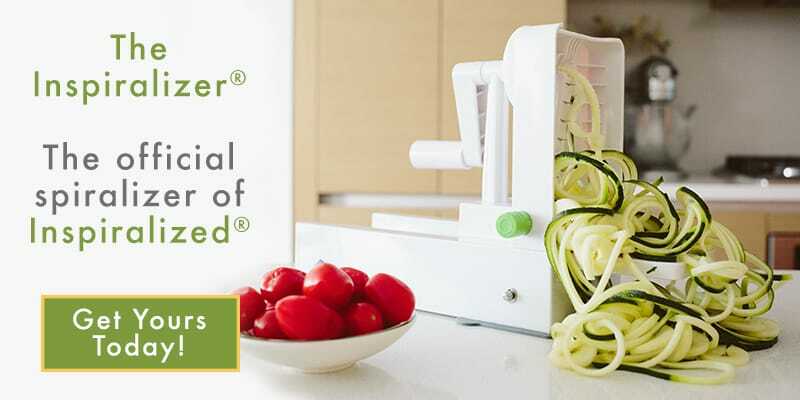 I love the spicy shrimp and the sweetness of the thicker apple noodles (made using Blade C on the Inspiralizer!) in this salad, but most importantly, I dig the curry vinaigrette. If you’re not a curry kinda gal/guy, leave out the curry powder and maybe add some apple cider vinegar (about a tablespoon) for a classic vinaigrette. And, of course, if you don’t want to search the supermarkets for goji berries, try dried golden raisins instead – or add in some pecans or pepitas for a nice crunch and added flavor. Place all of the ingredients for the dressing into a small bowl and whisk together. Place the kale and goji berries in a large mixing bowl and pour over the dressing. Toss to combine thoroughly. 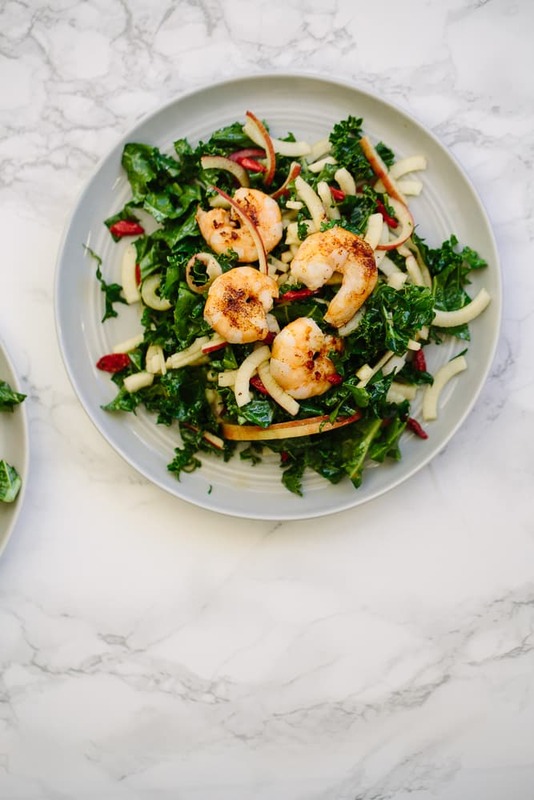 Spiralize the apple with Blade C and add to the bowl with the kale. Toss to combine and divide onto plates. Place a large skillet over medium-high heat and add in the olive oil. Season the shrimp with salt, pepper and chili powder. Once oil heats, add in the shrimp and cook about 2 minutes per side or until the shrimp turns opaque and c-shaped. Divide the shrimp onto the salads. Serve immediately. Thanks, Shelby!! Yeah! We're excited to explore a few more uses for these little gojis. It makes things a little more interesting. 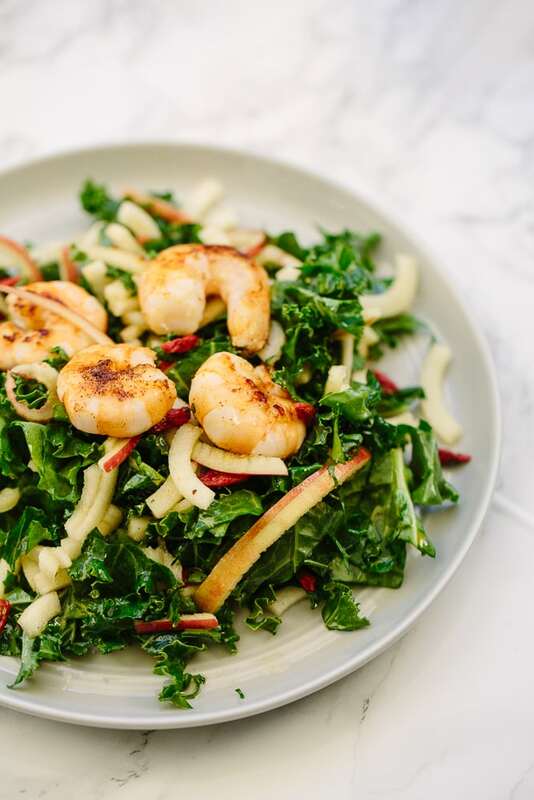 Loving the curry, apple, and kale combo here! I've been all about that curry lately. I think this would be great with some quinoa tossed in for an easy, packable lunch! Dear Meet Ali, Happy New Year! 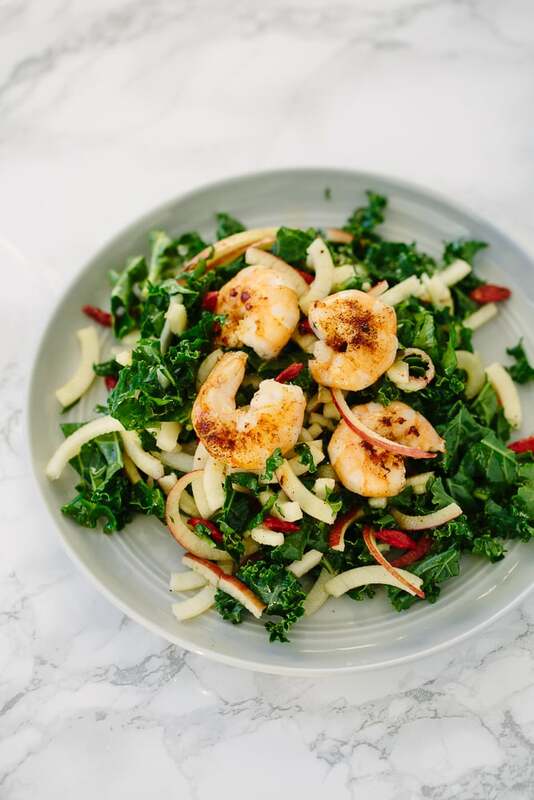 Thank you for your excellent article on CURRIED KALE AND SPIRALIZED APPLE SALAD WITH DRIED GOJI BERRIES AND SHRIMP. By the way, I wish you could add video in this article but the images were awesome. Keep the great writing skill up. Thanks again for giving me a good resource. Waiting for your reply! This recipe came together beautifully and especially loved the dressing and apple crunch. I used cranberries instead of gojis and will try with chopped pecans next time. This is actually one of my favorite spiralized recipes so far and couldn't be easier to make! Thanks Ali for being so creative and sharing your recipes!